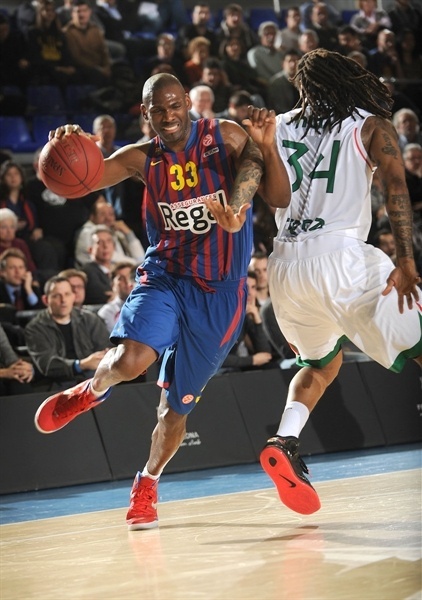 FC Barcelona Regal grabbed its fourth consecutive Top 16 Group F victory by topping previously undefeated Montepaschi Siena 85-66 at home on Thursday. The two teams are now tied atop the group's standings, each with a 5-1 record. Caja Laboral Vitoria has the chance to join them if it beats BC Khimki Moscow Region on Friday. The Italian champs hung around early, but reserve Xavi Rabaseda reeled off 10 second-quarter points and got plenty of help from Ante Tomic and an outstanding Marcelinho Huertas as the hosts grabbed 48-29 halftime lead and never looked back. Tomic led the winners with 20 points and 5 assists, Rabaseda finished with 16 points, Nate Jawai netted 11 and Marcelinho Huertas tallied 10 points and 5 assists. Bobby Brown paced Siena with 19 points and 4 assists, Daniel Hackett scored 14 and Benjamin Eze 12. Kristjan Kangur fed Benjamin Eze for a dunk that got Montepaschi going. 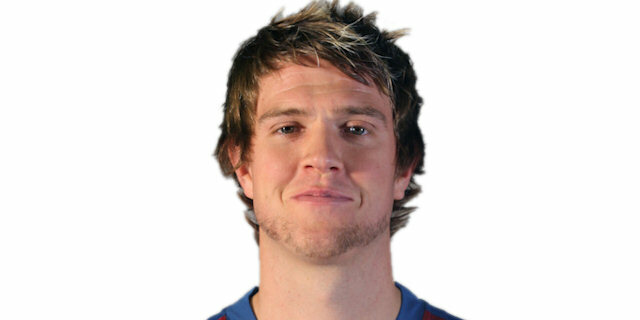 Marcelinho Huertas hit a running jumper and a backdoor layup by Joe Ingles soon gave Barcelona its first lead, 4-2. 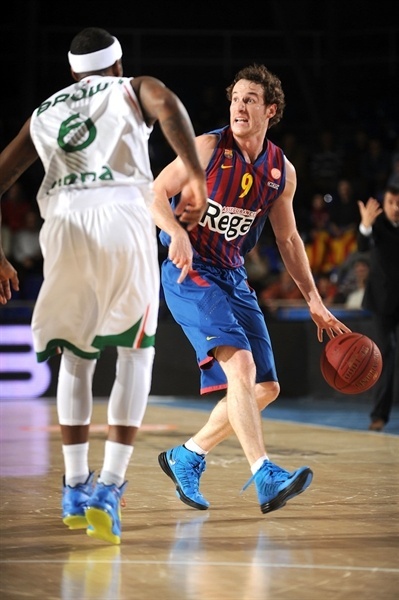 Huertas kept pushing Barcelona with a three-point play, which capped a 7-0 run. Eze split free throws, Ante Tomic scored down low, but a long jumper by Bobby Brown kept Montepaschi within 9-5. 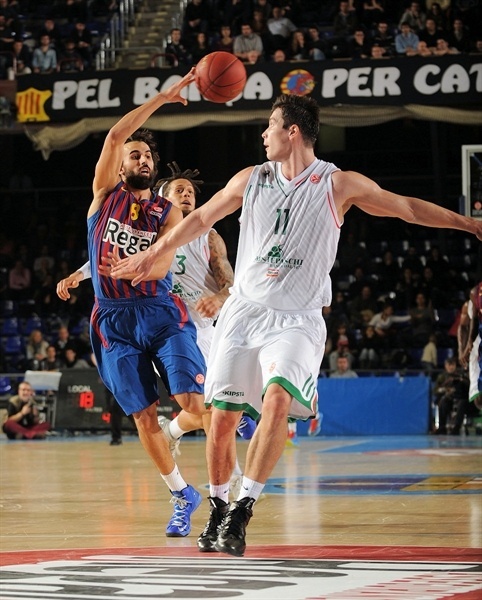 Tomic and David Moss traded baskets, as Barcelona tried to get its big men involved. Huertas fed Tomic for an easy layup. Barcelona held Montepaschi scoreless for more than three minutes. 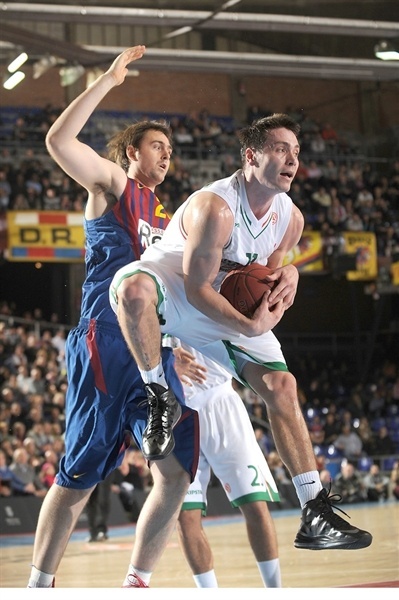 Meanwhile, Huertas downed his trademark running jumper to cause the guests to call timeout at 15-7. Eze returned to the floor and immediately delivered with a close basket. He soon found Brown for a wide open three-pointer that brought Montepaschi within 15-12. After Sarunas Jasikevicius swished a five-meter jumper, Eze and Nate Jawai traded free throws. A layup by Pete Mickeal gave Barcelona a 20-13 lead after 10 minutes. Jawai made free throws early in the second quarter, as Montepaschi struggled to find the way to the basket. Barcelona tried twin point guards with Jasikevicius and Victor Sada together on court, as Jawai kept pacing the hosts with a put-back layup that made it a double-digit game, 24-13. 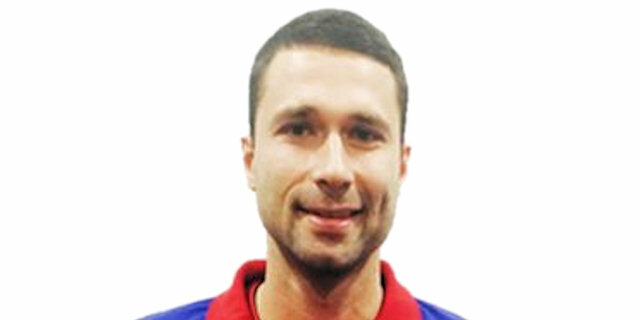 Aleksandar Rasic struck from downtown. Tomic hit a jump hook, but Daniel Hackett followed a driving layup with free throws to keep Montepaschi within 26-20. 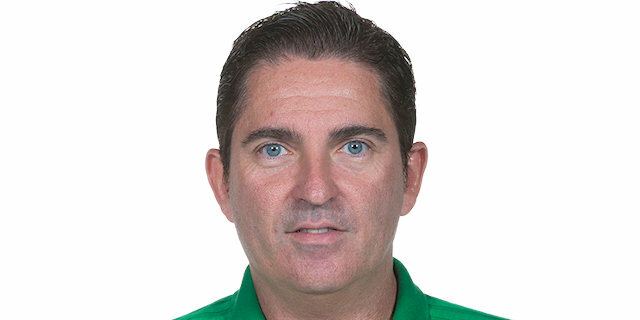 Xavi Rabaseda downed a three-pointer. Kangur shined with a high-flying tip-in. A three-point play by Lorbek boosted the hosts' lead to 32-22. 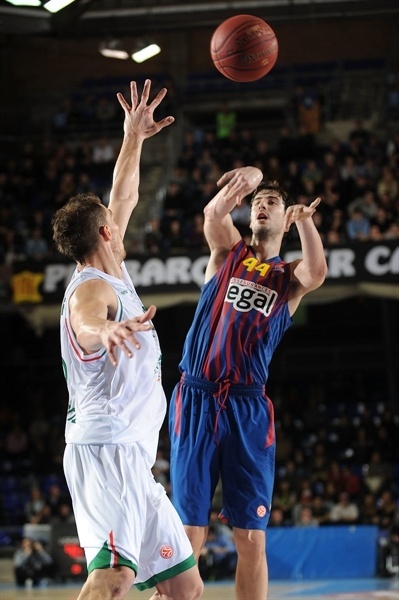 Rabaseda and Moss exchanged triples and a close basket by Ante Tomic kept Barcelona way ahead, 37-25. Rabaseda ignited the crowd with an alley-oop slam and soon added a fast break layup that broke the game open, 41-25. Mickeal made free throws and Huertas swished a seven-meter bomb, but Brown kept Montepaschi within 46-29. A layup by Lorbek fixed the halftime score at 48-29. Kangur tried to ignite a Montepaschi comeback with a fast break layup just after the break. Tomic stepped up with a basket inside, which Hackett erased with a reverse layup. Tomic stayed unstoppable with a jump hook and matched Eze's four-meter jumper with yet another basket, good for a 54-35 Barcelona lead. The hosts started to use longer possessions, trying to find open shots or to feed Tomic down low. C.J. Wallace struck from downtown and erased Hackett's acrobatic layup with a baseline jumper. Mickeal and Hackett scored in penetration, as Barcelona kept powering the offensive boards and running the game clock down. Mickeal added a wild driving layup off the baseline. 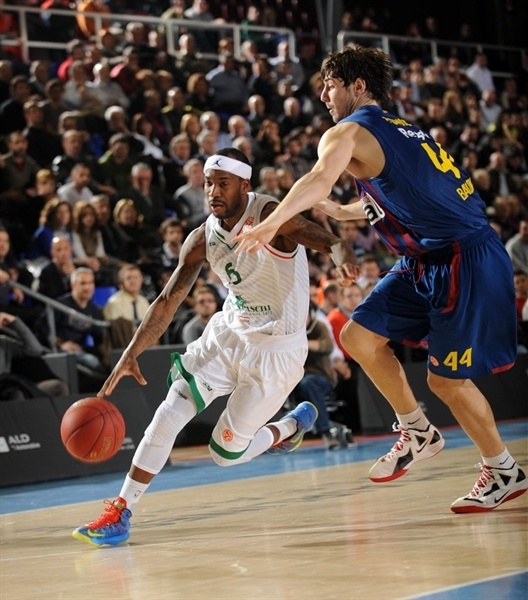 Brown made free throws and a three-point play by Jasikevicius gave Barcelona a 25-point lead. Matt Janning nailed a jumper, Hackett made free throws and a layup by Viktor Sanikidze brought Montepaschi within 66-47. 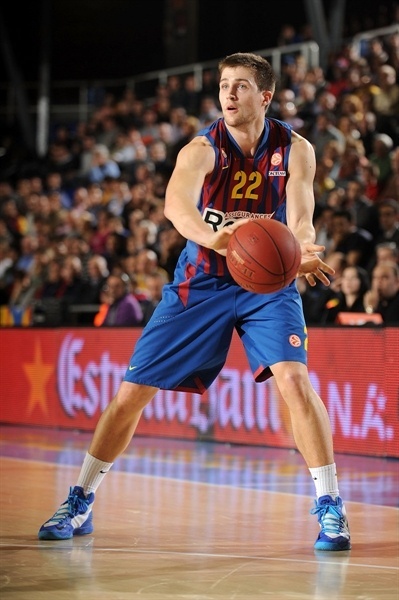 Free throws by Tomic created a 68-47 Barcelona lead after 30 minutes. Brown took over with a left-handed floating layup early in the fourth quarter, as Barcelona kept trying to find Tomic and Lorbek around the basket. Jasikevicius nailed a catch-and-shoot three-pointer, but Rasic answered from downtown to make it 71-51. Tomic scored again and Montepaschi called timeout at 73-52 with seven minutes to go. The outcome was already clear, but both teams kept fighting for point difference, which could be a critical issue later on. Janning scored around the basket, Rabaseda buried a triple and Eze kept the guests within 76-56. Brown downed a rainbow three-pointer, but when Rabaseda answered from downtown, everything was said and done. 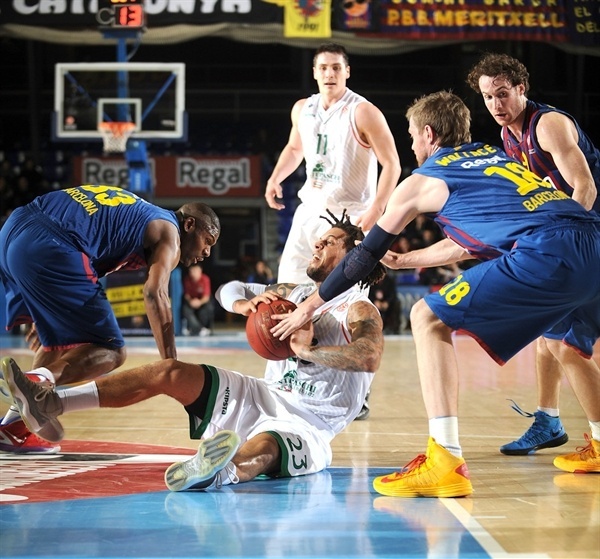 Barcelona had added a big home win and Montepaschi saw its winning streak disappear. "We are very happy with this win. We had a really solid game in all aspects and managed to make Montepaschi score less than they have lately, so I have to give my team credit for that. We worked very well and were able to stop most of their important players. We had some sort of control on the boards, played at a high rhythm and managed to run. We knew that they switch on defense to protect their big men. We managed to work against that really well and being honest, in general terms, we played really well tonight. I think that Bobby Brown is an outstanding player. He scored 19 points tonight despite our very good defense on him, especially in one-on-one situations. He is a player with unusual scoring abilities at the '1' position in Europe. We managed to slow him a bit, but even when we played good defense, he scored 19 points, which is a lot for a point guard. Xavi Rabaseda played really well, was really active. We hope that he managed to play with more continuity. 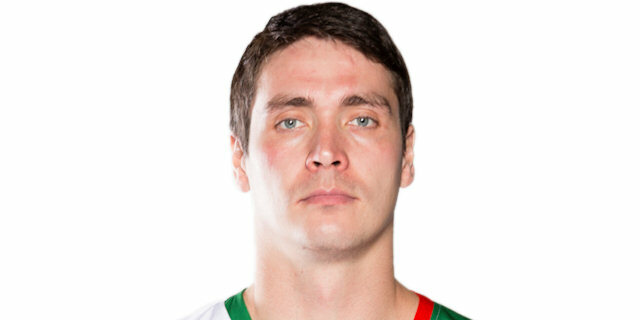 He is a very important player for us. He played his role really well and I am happy for him." "It was a difficult game for us. We arrived not in the best physical or mental condition. We have several injured players, come off a loss against Brindisi, which was not very good for us, and played against an opponent that showed organization, strength and motivation. As for the game, it is difficult to contain Barcelona's strength, especially around the basket, where we struggled. We switched from man-to-man to zone defense to try to set the game rhythm, but our game is linked to a good shooting percentage. We didn't hit outside shots and I have to give Barcelona credit for that. They played defense with great intensity and made it hard for us. We played a bad second quarter but fortunately, we managed to compete in the second half, without allowing Barcelona to extend its lead, because this loss has a lot of impact in the future. 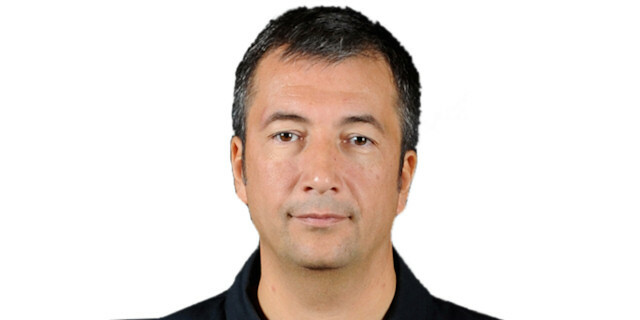 We knew that our team is new and had a lot of players without much Euroleague experience. It is a difficult yet stimulating season. We have to learn from this loss and raise our playing level in future games. Congratulations to Barcelona for the way they played tonight and especially to Xavi Rabaseda. It is great for any coach to have a young player that makes the most out of an opportunity. I hope this is good for his future, but not when he plays in Siena, please!" "Our defense was the key. They are dangerous on the fast break, and they have the leading scorer, Bobby Brown. They are a versatile team, so we did a good job of stopping them from penetrating and stopping their three-point shot. Tomic is our starting center and he is playing well. I am just coming in to back up and pick up the job where he left off, give him some rest. We are playing good right now, we are working hard and it is paying off. We tried to win by as much as we can because going to Siena is going to be tough, it is a hard place to play. We have an advantage of 19 points in fighting for the first spot, but we will have to go to their home and fight for a win." "Siena was missing some key players, I think Ress is one of their best players right now. So, we had to use this opportunity and take advantage of them being a little weaker than usual and win by as many points as we can because we know when we go to Siena it is going to be very difficult. I think we are now tied for the first place, and now we just got to keep looking forward. 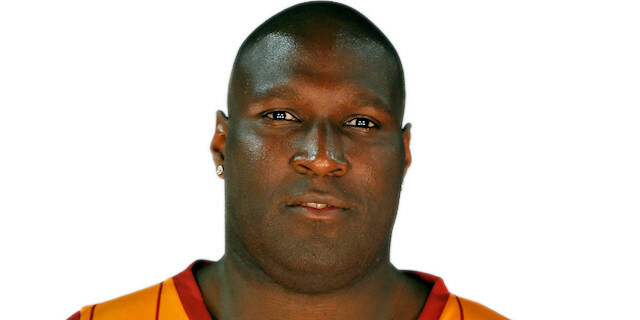 Our big guys played great, especially Ante Tomic and Nate Jawai. More than points they scored, they played great defense. That was the key. Siena is really talented offensively, but our big guys did a pretty good job against them." "We lost by 20 points, we did not play like we used to play this season. We were missing some players, maybe that is one of the reasons we could not play this game with a high level of intensity. We must improve in the next games. Every game is important, every win and every loss means a lot. We must approach every game as it is a final, and try to win it by as much as possible." "They were aggressive, and we were not. They had a lot of energy and aggressiveness in their home court, we were struggling under their pressure and that is the difference of 20 points. We have to forget this result fast, learn from this, make some changes. The next game is soon, we cannot think about this game much."